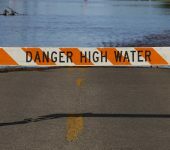 Recovering from a devastating flood that ravages your home is a difficult task for anyone, but losing a loved one right before a natural disaster is a brutal sequence of events for any individual to handle. Jesse Smith, 59, was still reeling from the loss of his wife Patricia last June, when his North Baton Rouge home flooded in August. As the waters filled the streets of his neighborhood, a friend came by on a boat and rescued Smith. 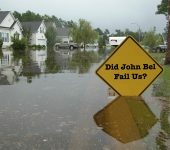 He stayed at Scotlandville High School, and later with relatives, waiting for the waters to recede. When he finally was able to return home, he discovered he was the victim of an attempted burglary. Looters had gone through the neighborhood, and attempted to enter his home before being apprehended by the police. 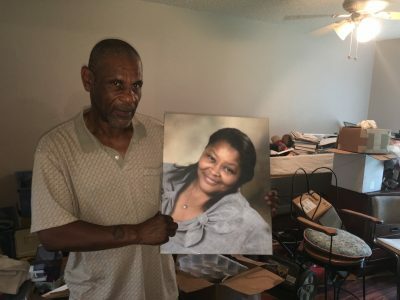 Smith, holding a picture of his late wife, Patricia, inside his Baton Rouge home. Smith then set about putting the pieces of his life back together, working on his home, which received nine inches of floodwater. The Louisiana Shelter at Home Program provided some temporary fixtures for his bathroom and kitchen, while he slowly added a new stove, water heater and washing machine. Along with his home damages, Smith lost his car to the flood, and like many flood victims, hopes to receive more government assistance to eventually complete all the renovations at his home. 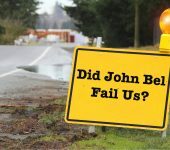 Smith says he understands the state government’s need to be cautious when allocating funds, but some flood victims should have been helped more quickly. With the help of many volunteers he was able to finish his flooring and drywall by early 2017. Because Smith lives alone, he and his dogs can recover at their own pace. His house is still askew with furniture and boxes of decorations, pictures and lots of his wife’s possessions covering the living room and kitchen. He gets emotional sorting through Patricia’s possessions, he says, and that some memories take a little longer to sort through. Every road to recovery from the catastrophic flooding is different, and Smith says he’s fortunate to have received assistance from his church, his family and other volunteer organizations through his church. In the wake of a tragic summer last year, Smith is forging ahead, putting his life back together, one piece at a time.